Our friend Micah Player is an amazing writer/illustrator. When he announced that he had some spots open for portraits, and we jumped at the chance. We couldn't be happier with the work he did. This is an absolutely perfect representation of the Petersen 5 at this point in our lives, and we can't wait to hang the print in our home. We’re coming to the end of another year. It seems like a ritual, but it never really feels like the end of anything, really. It feels like an observance that helps us mark something that we can’t really see, like a border. But it’s not really nothing either. When I think about the end of the year, it seems more like the articulated vestibule between train cars. We pass from one year into the next with a strange kind of effortlessness. You know you’re in between places, but that inbetween is a place of its own. Passing easily from one year to the next is not a satisfactory feeling. I sort of wish it was they way it used to be on trains before the vestibules: the noisy air full of soot and cinders, the gap between the cars requiring a bit of a leap to clear, the knuckle coupling pulsing and knocking malevolently as the train lurches along. As dangerous as it is to get from one car to the other, you know that you’ve done something once you’re across. You can take some satisfaction in that. I’m beginning to think that perhaps too much of the world is easy these days. So much of what we accomplish comes at the push of a button, at the end of an upload, or as the result of a tap or swipe. I realize how old and crotchety this will make me sound, and I suppose that’s about right. I am a middle-aged curmudgeon of sorts. So, instead of a Jeremiad about technology and the like, and instead of an annual family letter, I thought I’d present a snapshot of the Petersen 5 as they are right now as we’re passing from one car to the next. Hopefully, this can give me a baseline for next year’s passage. Maxwell is no longer in the nursery program at our church. Next Sunday, he’ll join the big kids in the primary program as a Sunbeam. With this kid we’re looking for any marker of age and maturity, because, despite his humor and intellectual prowess (not joking here), he is a runaway CPU process, a crotch puncher, and entirely deaf to the voices of his parents. He drains my batteries faster than any other thing that has ever been in my life to this point, and I’m including comprehensive exams, grading essays, and radiation treatments. We’re completely aware that we should not wish away any part of the kid’s temperment or wish him older. Curiosity is so hard to manage in a three-year-old and so lacking in adults. He’s got it, and we want him to keep hold of it. Maxwell also throws himself into everything so deeply that we could all take note. This is how you get things done. We’ll see what year four is like for this tiny tornado. Isaac is in the eye of the storm. At nine, he’s come through the harrowing times that his little brother is in, and he’s yet to move into the tempestuous tweens where his sister has been. Ike has his own battles as a middle child and struggles daily to remind us not to forget him. He is not inclined towards any of the sportsball programs, which is going to make him the odd boy out around these parts. He’s 100% nerd, with glasses and a skinny frame. He scrunches up his face when he thinks, and it’s apparent that he’s always thinking about something, usually Minecraft. He is so much like me at his age that I worry I don’t honor his uniqueness. We’re watching him closely, and we’re impressed with his humor and intellect and memory and his ability to feel deeply. I want to encourage him to charge up his batteries during this calm. Zoë is no longer in the primary program at our church. She’s moved on to the young women’s program, which means as a family, we’re poised for her to leave Tween Town for good. This year she’ll turn thirteen, she’ll advance from the seventh grade to the eighth, and a whole host of other transformations will take place. She’s made it through half of middle school without much drama (knock on wood). She is got it together, really, and I worry a little about what the future will hold for her. We hope that she’ll keep us in the loop, but that’s hardly likely, and it would hardly be her fault. Endocrinology is such a wild card, and as her body changes, her mind will, too. When I look at her, in her jammies, drawing lovely pictures of Totoro, I think of the maelstrom waiting to emerge. I want to be prepared for this. I hope that all those years working for the YMCA will supply some kind of Kung Fu for parenting a teenager. Alisa is very possibly in the most flux of all. She has had a cascade of changes in the last few months and will continue in that vein for a while. She left classroom teaching this summer to take a job as the coordinator for an elementary arts education program. She now mentors many of the art teachers in southern Utah. Her supervisor is retiring, so she’s planning to apply for her job. If she gets it; big change. If she doesn’t; big change. So, there’s no getting around that. She’s also finshing her master’s degree with a thesis addressing the effects talking about art has on how children create art. Like our own kids, Alisa’s in a transition at our church. For a long time she’s had a ministerial calling with the young women. This Sunday the torch was passed to others, and she’s relieved of that calling. It is almost certain that this coming year will be unrecognizable from this last one. So, that’s what the transition time between 2014 and 2015 feels like for me. I tried to take its fingerprints. In a couple of days we’ll jump across the gap. We’ll see you there. NOTE: this is an old post that got hung up in the draft phase for over a year. Ever since I first saw this Diane Arbus photograph, about twelve years ago, I have been enamored of it. I have also been envious of it, upset by it, even obsessed by it. It seems like this kid caught Arbus off guard. He challenged her. It lacks the ironic distancing that is so common in her work. It's so crazy looking and off the cuff and weird and in your face. It's a pretty famous image, so I know that others have had some kind of similar response to it, maybe not the same identical one that I've had, but something that punches me in the guts. Today at a Halloween party, I got the chance to get into that Arbus territory with a picture of my son, Ike, in his Doctor Who inspired costume. 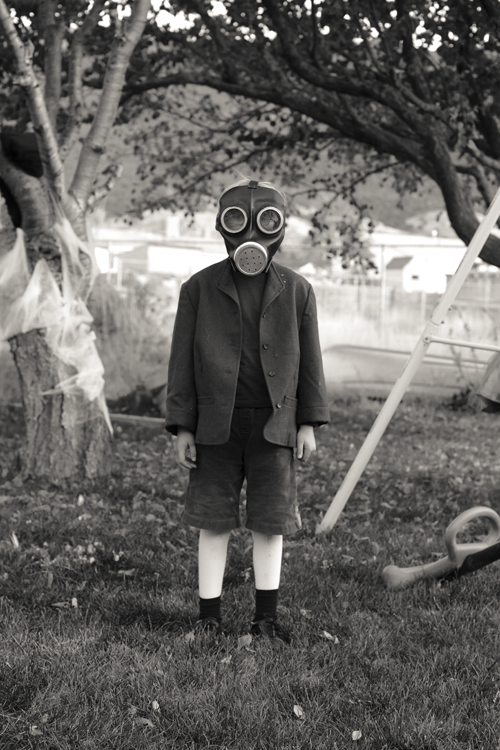 It's from the 2005 episode "The Empty Child" The boy Ike is dressed as is named Jaime, a child who was killed during the Blitz but who was resurrected (sort of) by some alien creatures but had his gasmask genetically fused to his face. He goes around asking everyone, "Are you my mummy?" It's pretty chilling in the show. This costume was Ike's idea. My wife, Alisa, put it all together. She made the gas mask herself, which is pretty impressive. And I got the shot. Being a kid rules. Being a parent of kids like this rules. I mean, seriously, when did we all decide that it's not cool to wear a construction paper headband with kangaroo ears stapled to the sides? Alisa and I are (obviously) awaiting the arrival of another little boy. Could be any day now. We've both been thinking a lot about what it means to be a parent, and what it means to get these kids raised in such a way that they can (a) function, (b) succeed, and (c) rock this world. It takes time and it takes patience and it takes a willingness to make all kinds of mistakes, but it is really the coolest thing I've ever done, which is why we want to do it again. Sure, there will be lots of crying and sleeplessness, and poop, but there are also moments you get when your shy daughter gets on stage to sing and dance and when your son says, "Wait, let's stop and clean my room, Zoë. If we don't, I won't be able to have any screens tomorrow." I have more to say on my style of fathering (cheeseburger + Marvel Comics iPad app), but suffice it to say, I've been feeling kind of glowy and happy about being a dad lately. I will be the first to admit that this kid is a little obsessed right now with Doctor Who, but given all the possible things in this world a little boy could become obsessed about, I am okay with a hero who doesn't like guns or things military, who gives every creature in the universe a choice and a chance, who thinks that human beings are "brilliant." And, he could totally be the Doctor if they ever needed a five-year-old blonde version. The thing is, this stuff (hair, screwdriver, etc.) is pretty much all his idea. Even the pose here was 100% his. He got all set up like this and marched off to church, gaining all kinds of attention, mostly from old ladies who wanted to gobble him up and lick the sweetness off their fingers. More photos from the shoot at Facebook. It took a while, but we finally have a full set of portraits, now to send off for printing, then matte, frame, and hang in the house. I was shooting for naturalistic, informal portraits that focus more on what the family feels like. It think it all worked out. What started with a lens and camera calibration check is turning out to be a full fledged family portrait project. I think these photographs really capture personality as well as the look of each person at this point in our lives. Here's the five-year-old, Ike. Next will be to catch the elusive critter, Zoë Ingrid. The other day we found this drawing in the house. It was done by our four-year-old son, Ike. At first glance it might seem that our sweet little boy is a little bit fixated on—let's just call them "lady parts." But you'd be wrong. Dead wrong, actually. After a little questioning we discovered that these are actually the young artist's rendering of a pair of Cylon Raiders. Innocence restored, for a season. On Superbowl Sunday, we made all the game day food (wings, guacamole, etc.) and then Alisa watched Masterpiece Theater. I read Proust. And, oh, yay, without any help from the Petersen family, Manning took a dive so New Orleans could win, selflessly healing the country, just like Sandra Bullock. Sorry, America. Football is boring. Zoë has astounded everyone with her announcement that she would very much like to audition for a local production of Seussical: The Musical. This comes from a kid who is pretty close to winning the Oscar for shyest person in the universe. Here's a secret video of her song rehearsals. She chose Priscilla Ahn's song "Wallflower," which isn't really a Broadway hit, but we don't listen to many Broadway hits around here. In this respect, Alisa and I are useless to her budding career in musical theater. Zoë's Audition Practice from Todd Robert Petersen on Vimeo. We're proud of her. She auditions at 5:15 on Monday. Wish her luck.